Japanese Episode 272: "FURU BATORU no Hate ni! Sorezore no Michi!" English Episode 610: "Johto Photo Finish"
The final battle of the first match in the Jouto League Finals pits Satoshi's Lizardon against Hazuki's Bashamo. The battle begins, and Satoshi quickly finds out that Hazuki's Bashamo has amazing jumping abilities, countering any disadvantage it may have against the flying Lizardon. The two exchange a number of powerful attacks, and Lizardon seems to gain the upper hand when it Earth Tosses (Seismic Tosses) Bashamo. However, everyone is shocked to find that Bashamo has survived the attack with minimal damage! The two continue, and after a powerful explosion of attacks, Lizardon goes down for the count! Satoshi has lost the match, but the young trainer doesn't seem to mind losing to the skilled trainer from Mishiro Town. Later, Satoshi says goodbye to Zenigame and Lizardon and also bids Hanako and Ookido-Hakase farewell as they return to Masara Town. Satoshi-tachi stay behind to see Hazuki's battle against Toshiya, which Hazuki ends up losing. 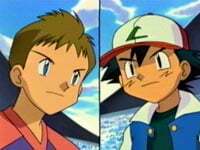 After the battle, Hazuki tells Satoshi that he plans to continue traveling through the Kanto region while suggesting that Satoshi travel through the Houen region. Suddenly, a scream from the distance prompts everyone to run toward its source, which happens to be two young women scared of a couple of ghosts. The ghosts, Mumaa, are upset because a friend of theirs is in trouble, so the group, joined now by Shigeru, goes to help the little pokemon. Once the Mumaa is saved, Shigeru tells Satoshi that he has a new goal--to be a Pokemon Researcher, just like his grandfather. Satoshi wishes him good luck on his goals, and just as they part ways they are attacked by the Rocket-Dan. However, Musashi-tachi are no match for the Jouto League participants and are blasted off quicker than usual. Shigeru, Hazuki, and Satoshi-tachi all part ways and wish each other luck in their endeavors. One word describes this episode for me--rushed. While it certainly started out with a great battle (complete with some terrific Studio Pierrot-esque animation), the episode just kinda goes downhill after the battle ends. We get a whole ten seconds or so devoted to Hazuki's final battle, and another ten seconds to conclude the tournament altogether. And that's it. No grand finale, no final ceremony, nothing like that--they just gave us a quick glance at the end of the league to wrap things up so they can rush Satoshi over to the Houen region that much quicker. Whatever happened to Moe? Or Jun'ichi? Who is Toshiya? We never find out because the writers don't know how to pace an episode. Honestly, they need to study the Dark Tournament saga of Yu Yu Hakusho to find out how to do a fighting tournament right. And for what did they rush the tournament scenes? A scene with a bunch of Mumaa and yet another Rocket-Dan attack. The Mumaa scene seemed like a waste, and, even though the Rocket-Dan's attack pretty much finished off their little Silver Conference side-story, that too felt a little too filler-y to me. However, the big complaint from me is Shigeru's decision to be a Pokemon Researcher. The whole "I want to be a Pokemon Researcher!" just came completely out of left field, and there was absolutely nothing before this episode to indicate that he had any interest in simply studying pokemon. The whole thing came off as a cheap plot contrivance to get him off the show. Anyway, enough bellyaching. This was a typical Jouto dub episode, so there isn't too terribly much to report (that'll change next episode, though). I was really surprised that they kept the Japanese name of Toshiya's hometown intact, but the bad music kinda distracted from the good job 4Kids did. The Japanese version of this episode had some really great music (I think the music that played during the Bashamo/Lizardon battle up until Lizardon performs its Earth Toss (Seismic Toss) technique was created specifically for this episode), but 4Kids replaced most of it with more generic dub stuff. Also, I'm reminded of what a shame it is that 4Kids doesn't dub the Next Episode Previews, since the preview for next week's episode was really special. It was narrated by Kasumi (Satoshi usually narrates the previews), and she prompts the audience to watch her as she participates in her "last battle." It really makes her departure that much more special, and it's a shame that the dub won't/can't show it. 4Kids is overworked? What gave you THAT idea? Announcer: "The winning trainer is Harrison from Silver Town." Yeah, that should be Littleroot Town, since there is no such place as Silver Town. In the Japanese version, the commercial break occurs right when the group arrives at the tower with all the Mumaa. Right before Takeshi tells Satoshi to use his Yorunozuku to expose the Mumaa, there's an establishing shot of the tower and all the Mumaa flying around it. This shot was cut from the dub. I've noticed that the September 11th censorship seems to have vanished from Kids' WB! Here we have an entire sequence where a building is attacked, burned, shocked, and ultimately blown up, and not a frame of it is censored. It's certainly nice after the other buildings-being-damaged scenery Kids' WB! has edited out before. And did anyone else laugh at the crowd's reactions to the movable building? "It's got arms! It's got a head!" I don't know why, but that just cracked me up for some reason.